Love when these little bluebirds just appear from nowhere - and stay long enough to get a shot. They're so little. Oh, I was so excited to log in and see this! One of my favorite birds and you captured it so beautifully! Brightened my gray day, too! Beautiful texture, colors and focus. What a pretty bird, love his expression. A Fav! for this sweet little bluebird. The sight of him has brought much happiness! Love the blue bird! Nicely composed, beautifully focused! What a pretty little bird! Excellent shot! I love this sweet shot! What a beautiful pop of blue. Beautiful capture of this blue bird! Such a cute pose. Wonderful capture! Following you! Gorgeous! 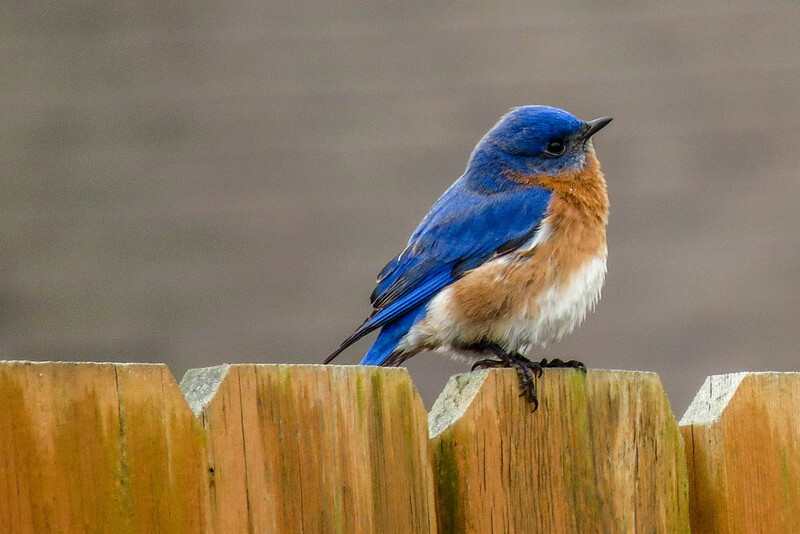 Bluebirds are rare here, I'm always excited when I get to see them. Lovely! Great composition and clarity! Wow -- the color is amazing! I could get to like your little bluebirds more than the cardinals! And I love a cardinal! Great sharp image. Gorgeous bird and fabulous capture. FAV. A beuatiful capture! love the clarity! Beautiful capture. The DOF puts the emphasis nicely on this little guy. Oh yes.....huge fav. This is definitely Birds and Blooms cover page worthy!!!!! Wow! Lovely composition and depth, beautiful capture of a beautiful little bird. Love the intent look, or is it listening out for something? So beautiful! Great picture, the bird is a cute. What fantastic colours and you've shot with such great light. Lovely.